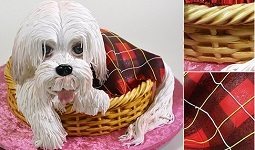 Lambeth piping is one of the most skilled techniques in cake decorating and probably the most admired too. 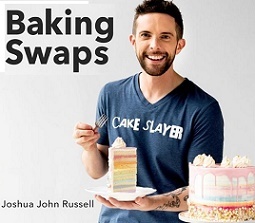 It’s named after Joseph Lambeth who popularised this ornate style of cake decorating in his book The Lambeth Method in 1934. Lambeth piping is based on the centuries old English tradition of “overpiping”, creating rows and rows of intricate piped details, srolls and garlands. 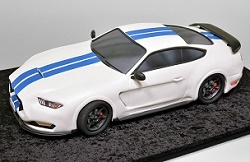 It’s the most lavish style of cake decorating and therefore usually reserved for very special occasions such as weddings and christenings. With the arrival of smooth fondant cake designs in the late 80’s, Lambeth piping fell out of favour and became somewhat of a lost art. 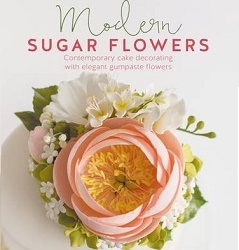 But it’s now firmly back in cake decorating fashion with vintage styles to the fore in cake decorating trends. One of the UK’s few masters of this art is the very talented David MacCarfrae of the fabulous David Cakes of Distinction in Liverpool. 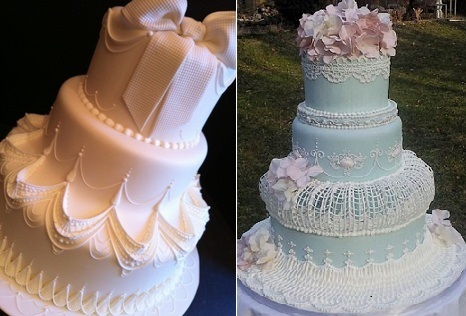 David created the superb Lambeth piped cake above right and both examples below. 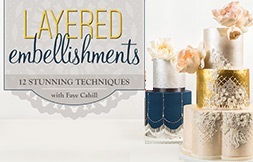 The spectacularly talented ladies at We Bake in Heels created the show-stopper (top right) with layers and layers of detailed scrollwork. 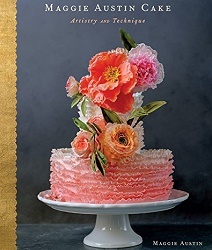 Martha Stewart has been at the forefront in the US in bringing Lambeth piping back into vogue, showcasing the work of US master decorator, Wendy Kromer (cake design below left via Martha Stewart Weddings). 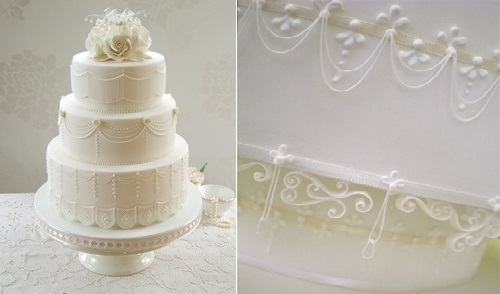 The J’adore Cakes Company created thes splendid wedding cake below right also in the classic Lambeth piped style. 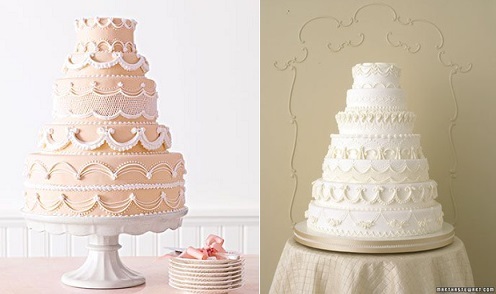 Colette Peters of the famed Colette’s Cakes in the US created the beautiful column style wedding cake below left in a nod to the Lambeth method, while the cake the right by Showcase Cakes by Ginger showcases the intricacy of the Lambeth method further. Wendy Kromer has pioneered the promotion of lambeth piping as well as modernising the style, particularly with the addition of colour. 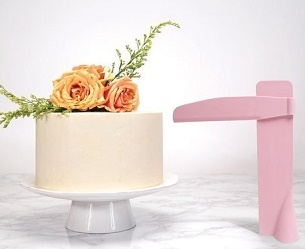 Below right we have one of her classic lambeth piped wedding cakes in white and on the left, a modern twist with the traditional Lambeth piping set against a backdrop of peach icing (images via Martha Stewart Weddings). 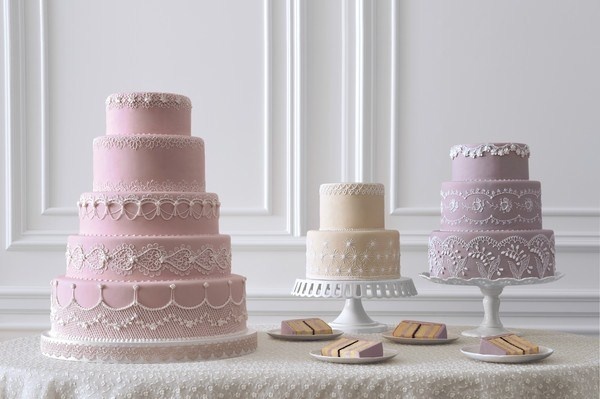 Below, a selection of wedding cakes decorated with elegant lambeth piping in soft pastel shades also by Wendy Kromer (via Martha Stewart Weddings). We have two more exquisite examples of lambeth piping below bringing a touch of the modern to the traditional. 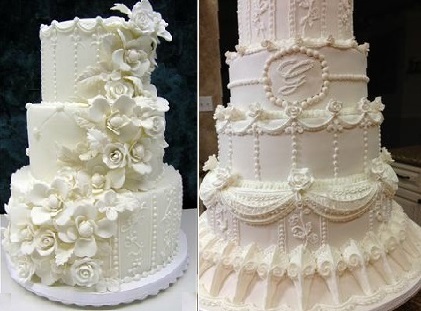 On the left Susan Trianos Cakes have added a funky fondant bow to their elegant creation. 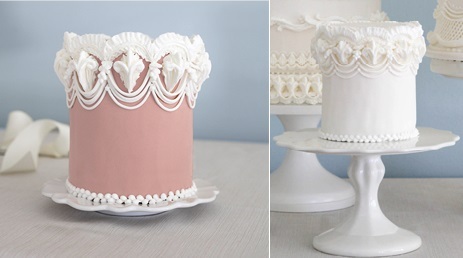 On the left, Edible Art by Kate have combined pastel blue and pretty pink for a stunning up-to-date interpretation of the classical Lambeth piped wedding cake. 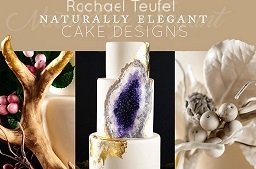 Another of the UK’s royal icing masters, Helen Mansey of Bellissimo Cakes, has created the delicately piped beauty below left. 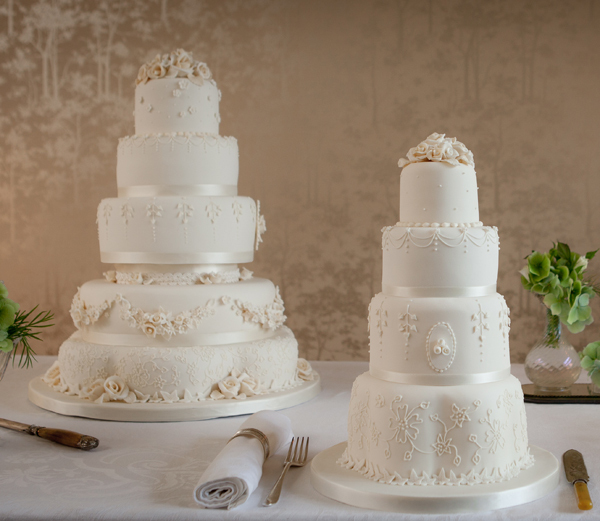 Bellissimo’s Cakes wedding collection features a number of designs with elegant piped detailing that really sets her collection apart. The very pretty piped pattern below right is by Rosey Sugar . 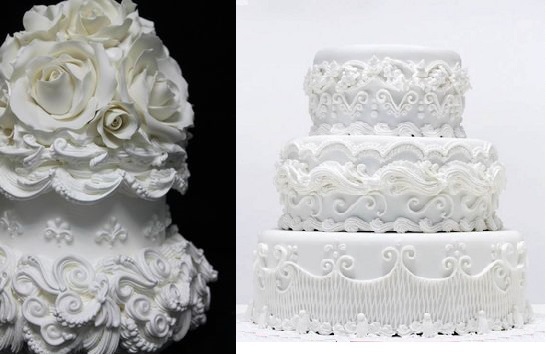 Royal wedding cake designer, Fiona Cairns incorporated many elements of the Lambeth style in her wedding cake masterpiece for Duke & Duchess of Cambridge and below are two more examples of her piped wedding cake designs incorporating elements of the classic Lambeth style. 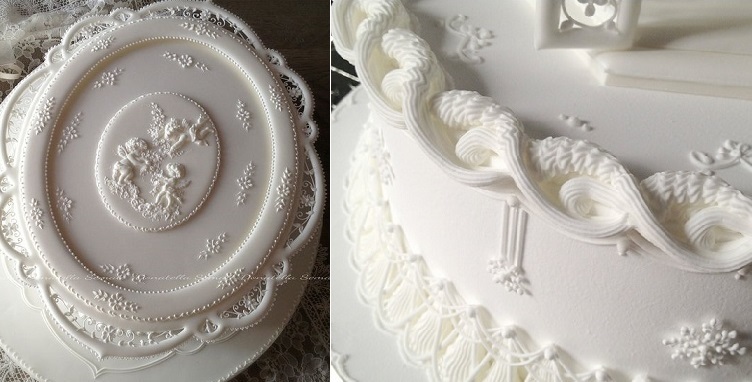 Italy’s master of the art of Lambeth piping, Donatella Semalo, has created the beautiful all-white christening cake below left as well as the piped example to the right, based on designs by legendary royal icing expert, Eddie Spence (author of The Art of Royal Icing ). While lambeth piping is usually reserved for wedding cake decoration, it makes a stunning single tier celebration cake also. 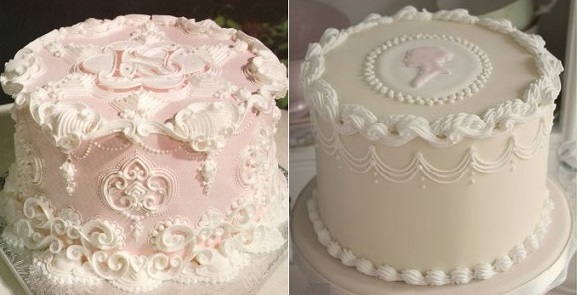 We have a lavishly decorated cake below left from Wilton and an elegant, up-to-the-minute design by Cotton & Crumbs right. 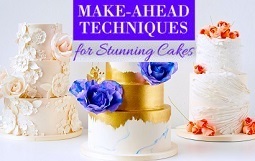 If you missed Part 3 of our Piping Techniques series on scroll piping, we strongly advise you watch royal icing expert Ceri DD Griffith’s excellent piping basics tutorial that demonstrates how to pipe shells, snail trails, ropes, barrels, scrolls as well as overpiping techniques. Next, you can try master decorator Roland Winbeckler’s tutorial on how to pipe an overpiped double reverse border. As well as his advanced drop string piping tutorial. 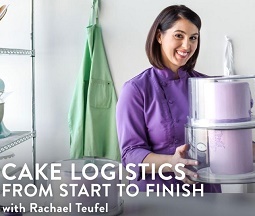 Charlotte Feve has created a fantastic 25-minute lambeth piping tutorial taking you from start to finish with an exquisite piped single tier cake. 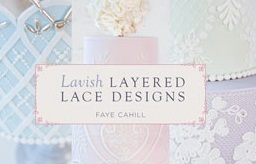 Imaginative Icing UK have created a square Lambeth design cake tutorial for beginners also. 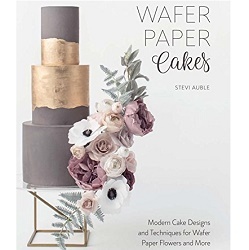 Finally, Wilton have a tutorial on how to pipe an iced curtain which is incorporated into many Lambeth piped cake designs. 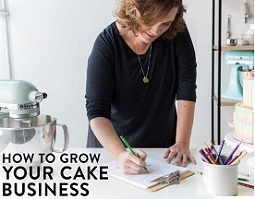 To take your piping skills further, classes in Lambeth piping are now available due to the revival in popularity in this style of cake decorating. David MacCarfrae teaches both internationally and in the UK so check out his website for the latest classes: David Cakes of Distinction. 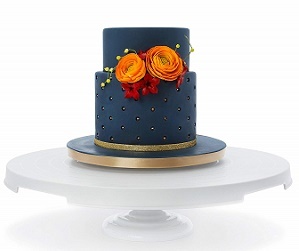 Wendy Kromer is teaching online on Craftsy, including the beautiful cake designs below. You’ll find more details on her class here: Learning the Lambeth Method, Wendy Kromer. 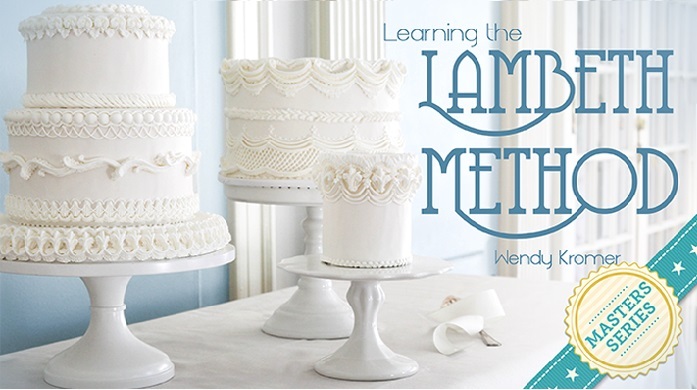 Wendy teaches the three cake designs below as part of her class online: Learning the Lambeth Method, Wendy Kromer. 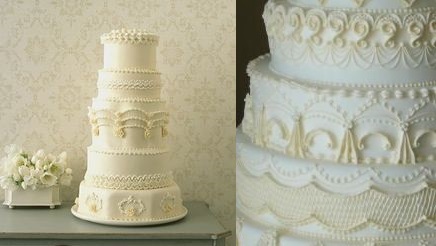 Readers might also be interested in our features on: Downton Abbey Style Wedding Cakes, Edwardian Inspired Wedding Cakes, Lily of the Valley & Lace Wedding Cakes, Petal Shaped Wedding Cakes, Pomander Wedding Cakes, Pedestal Wedding Cakes, Scalloped Cake Designs, Doile Lace Cakes and Lace Veil & Mantilla Wedding Cakes.